Footwear brand Dr Martens has announced plans to double production in the UK by 2020 as part of a £2m investment. The plans will see 165,000 pairs of shoes and boots a year produced at its factory in Wollaston, Northamptonshire. A visitor centre will also be built which will allow fans of the brand to tour the factory, which opened in 1901. Chief executive Kenny Wilson said: "This investment demonstrates our ongoing commitment to Northampton." In October, the firm announced profits were up after strong sales in Europe and the Middle East. 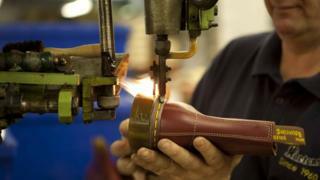 Although most of its boots are now made overseas, about 70,000 a year are still made at the Northampton factory. Mr Wilson said: "We are really proud of our history and of our roots in Northampton. The city has played a huge role in the growth of our brand and we want people to be able to experience this. "We can't wait to open our new visitor centre and welcome Dr Martens fans, both new and old, through our doors."